Sony had a very pleasant surprise in store for us at this year's MWC and that was the new Xperia X line. Meant to replace the current Xperia Z flagship series, there are three new arrivals to look forward to – the midrange, side bezel-free Xperia XA, the slightly more powerful Xperia X, and the top-shelf class Xperia X Performance. Thus far, we didn't know much about pricing and availability for the new handsets, besides a promised June launch, and a reported “exclusive offer” for users that pre-order the Xperia XA or Xperia X. Today, Amazon's UK website has listed a couple of the new handsets up for pre-order. Priced in British Pounds, of course, we now know that the Xperia XA will run for $345 (£239.99) and the Xperia X will don a $720 (£499.99) price-tag on that side of The Pond. The listings claim that the XA will, indeed, launch on June the 10th, but, surprisingly, the Xperia X's release date is pegged at the 20th of May. We've also got a glimpse at the available finishes for both handsets — while there will probably be more when Sony starts churning out the new handsets en mass, we currently have a Black and Rose Gold Xperia X, and an Xperia XA in beautiful Lime Gold, White, and Black. Interestingly, there's still no word on the Xperia X Performance – it was not mentioned in the previous report about pre-order bonuses, and it's nowhere to be seen on Amazon right now. The most powerful smartphone of the trio will probably be released even later than June and, seeing how the smartphone launches are currently spaced out, one could assume the X Performance to launch in July. But that's just an educated guess. As a reminder, the Xperia XA packs a 5-inch, 720 x 1280 display, an Octa-core MediaTek Helio P10 MT6755 SoC, 2 GB of RAM, 16 GB of expandable internal storage, a 13 MP main camera with phase detection autofocus, and an 8 MP selfie snapper. 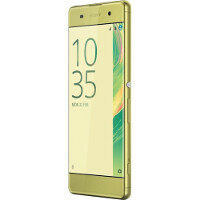 The Xperia X hauls a 5-inch 1080 x 1920 display, a hexa-core Qualcomm Snapdragon 650 SoC, 3 GB of RAM, 32 GB of expandable storage, 23 MP camera with PDAF, a 13 MP frontal cam, and the side-mounted fingerprint scanner, seen on the Xperia Z5. The Xperia X Performance, whose price and release date are still a mystery, dons the same hardware as the regular X, save for having a quad-core, flagship-class Qualcomm Snapdragon 820 SoC. 720$ for the X! And people wonder why Sony is making loss on phones. Better buy a Z3 for half the cost. Well phones always get marked up in the UK, so if it does come stateside it will likely be less. And given the flagships are around 600 GBP there, 50p sounds reasonable given that it has the same stuff as the flagship save for the weaker chip. Same cameras. Same battery. Same display. Same design. Well if you shop around, you can actually get a S7 for under £500. Xperia X, wallet destroyer of the year. Really disappointed by Sony. Their marketing is abysmal and they never seem to care about customer feedback. Sure so the X in black is nice and all and I might have bought it instead because I am still that much of a fanboy for them (as much as I hate to finally admit) but guess what? It's at least 2 months too late. By then the Galaxy S7 will already be sold unlocked 10% lower than MSRP and be much cheaper with more advanced tech. Mid range phone, for flagship price. Then don't even offer the X Performance in key markets like UK and Germany. Sony has officially lost the plot. Promised June launch? Are they smoking? Is there anything of the Sony X lineup to make it stand out from the rest? Still the same design as the Z series and that didn't sell well, why did they do it again? The X is worse than the Z5, why would anyone choose it over that? The price for sony phones are always high, they really should do something about that. Sony, when people told you to be compete samsung, they didn't mean to have higher price. They should rethink their pre-order prices. XA price is not bad. But it will probably be 30% less in 2 months. Very cheap then. The "X" is going to flail harder than a magikarp. Xperia Used Splash, But Nothing Happened! He thinks that selling Sony xperia x 700 $ ?. It is drugged or ?. This is a scam that must have cost quietly Xa $ 299 and one X had to sell $ 400-450. Sony, my favorite brand gives me the impression that no longer wants to continue in the cellular business. Xperia XA seems like a pretty good mid range deal. But Xperia X is overpriced. X is £399, not £499.